The Results Are In: Kanye West Wins STYLE WAR! All month long, Complex and Nah Right have been holding our STYLE WAR competition to determine who the best dressed rapper of all time is. 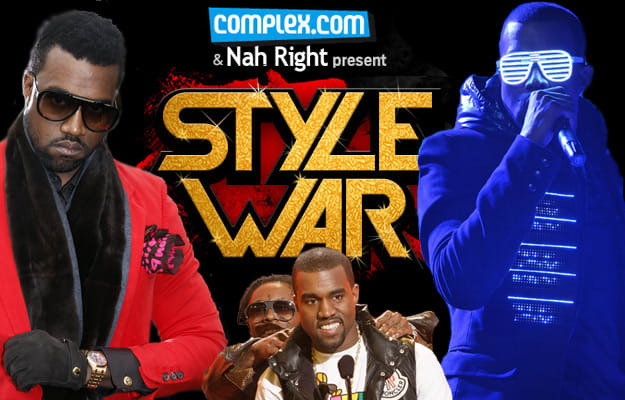 After fighting things out in 5 rounds of bracket-style battles, sifting through 64 fashion-forward rappers, the voters have finally spoken: KANYE WEST is the STYLE WAR King! In the final round, Complex&apos;s current cover star received a whopping 77% of the vote against Jay-Z, who scored only 23% of the vote, despite taking out heavy-hitters like Biggie, T.I., and Diddy before going head-to-head with Kanye. Along the way, Mr. West also took out tough competitors like Pharrell, Lupe Fiasco and The Fresh Prince. Thank you to everyone who voted, and congratulations to everyone who won a prize along the way. CLICK HERE TO SEE THE FINAL STYLE WAR BRACKET!